It took us more than five years to hit one billion rides, but less than nine months to birth our next billion. Simply put, we provided as many rides in the last nine months as we did in the first five years of our existence. Grab started in 2012 on the simple premise of making commuting safer for women. Today we provide accessible and convenient transport for all across Southeast Asia. Since our last billion rides, we’ve travelled more than 6 billion kilometres, enough to go round the world nearly 150,000 times. While some people may profess they “love you to the moon and back”, our Grab mileage can actually get you to the sun and back – 22 times. Yet on Planet Earth, not all rides are equal. Singapore may be the smallest country in the region, but it had the longest average distance per trip. At 11 km per ride, it was almost three times further than that in Cambodia. Singapore not only went the furthest, but it was also the king of GrabPay. More than three quarters of its rides were cashless, paid through Grab’s e-wallet, GrabPay. While the average trip in Indonesia covered just 5 km – the second shortest in the region – users and drivers in the archipelago were the chattiest, sending an average of five in-app chat messages to each other per trip. 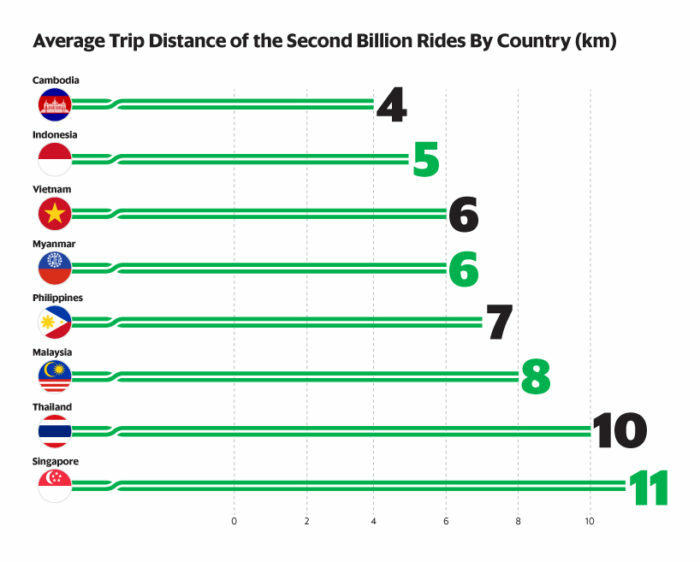 It was on Saturday, July 7 that we clocked two billion rides. At exactly 10:19:44 (GMT +8), 103 trips started in 21 cities across seven countries, helping us usher in a new milestone. Of the rides, half were in Jakarta alone. At that precise second, in the only shared ride of the moment, two strangers in Singapore headed towards Marina Square together. While up north in Klang Valley, Malaysia, one of Grab’s long-time passengers was on his 878th ride. Some 3 km away, a new driver just four days on the job was picking up his second fare of the day in a GrabCar.